Forged from corrosion-resistant surgical stainless steel, these Umbilical Cord Scissors have been designed to effectively cut through the tissue of the umbilical cord. They are an essential instrument to keep in surgeries and delivery rooms for standard obstetrics and gynaecology procedures. 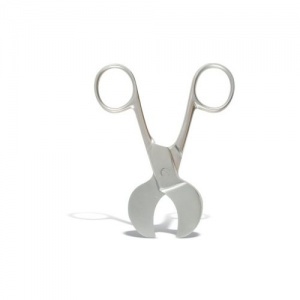 These small Umbilical Cord Scissors are available to buy in single pairs. They are made from stainless steel, 4.5cm in length and feature distinctive wide, curved blades in order to effectively cut through umbilical cords. These scissors are typically used without clamping the umbilical cord, as the curvature of the blades holds the cord firmly in place. The Umbilical Cord Scissors are not only a necessary item to stock in the delivery rooms of the maternity wards at hospitals, but are great to have at veterinary clinics and farms to use for animal births, too. The Umbilical Cord Scissors are usually dispatched via First Class Royal Mail and delivery should be within 1 to 3 working days.